You've been planning this day for quite some time. Every detail is in mind, and has been since maybe you were just a kid. You've thought of the bridesmaids dress color, the intricate lace on the dress you said yes to and even the type of cake you might like. Something you might not have thought about at such an early age is the wedding bouquet toss and the good fortune it brings upon your single friends! What song will you choose? Will it be in the mix of your fun dance songs or will it be beforehand to get everyone on the dance floor during the wedding reception? Will you do a small dance before hand? Will you have a lot of single ladies to catch the bouquet? Will you miss? 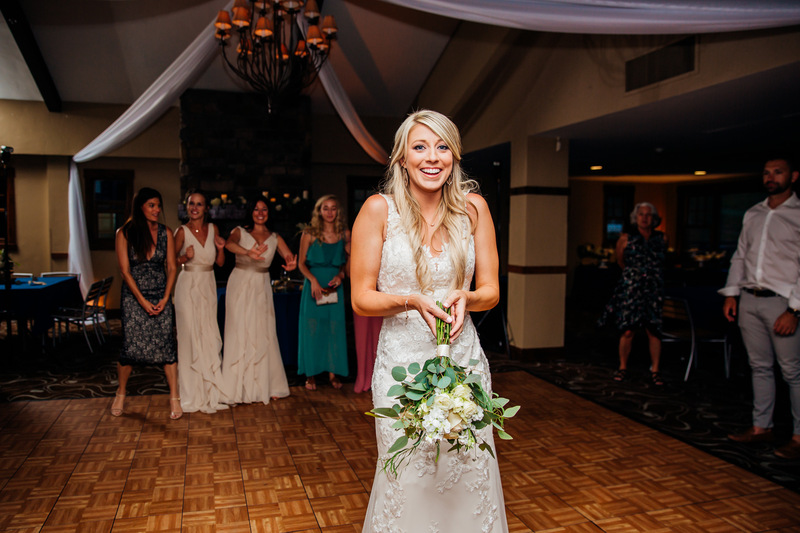 Not to worry, bouquet toss comes naturally and is one of the most exciting parts of the night, because it's a moment just for you and your girls. Modern weddings are all about fun and laughter and what's best to capture both then the bouquet and garter toss? The bouquet toss is a timeless tradition where the single female guests line up behind the bride to catch the bouquet aka superstition fabric. Rumor has it that the lady who catches this magical bouquet is surely to be the next to wed and is filled with good luck. The night unravels by songs played, crowd dancing, and the announcement that it's time. The bride returns to the dance floor, the DJ plays the perfect song, maybe Raining Men, and she then throws the bouquet into the crowd behind her. This lucky woman now has a piece of the bride and the good sense that she caught it over all others. Your photographer would love to capture the moment you realized that your kindergarten friend caught it. To commemorate, you both take a picture together and see if the wish comes true! American Woman is the perfect tribute to all the independent ladies that are doing just fine on their own, but definitely want to catch that bouquet. For the competition of it, of course. Celebration is the go-to family fun song for the occasion. Everyone recognizes this song, so it's easy to get everyone involved with the activity! Who doesn't want a good laugh? Plus it's exciting for the crowd. Everyone makes side eyes wondering who's more uncomfortable. There's always 1 person to break the ice and that really gets the evening going. If you want a pop of 80's, this is your go to. Plus, it's fun to serenade to. Let's go girls! A pure ladies track right here. This one's the perfect fit if you want a twang of country to your night coming from the Queen of Country, Shania Twain. This one is the best fit for the most confident of brides! Really let loose and have fun with this one. It'll be one to remember. Surely to give some guests a good laugh, and throwback. This classic is used quite often! The most elegant bouquet toss song on the face of Earth. It just doesn't get better than this, unless you're getting married in a white church as well. This one gets everyone's hips moving, listen to the song and try to resist yourself. It's quite the challenge. An absolute recognition to all ladies. Who doesn't get pumped when Queen B sings ESPECIALLY when she's showing off her wedding ring? Definitely a must play for your wedding songs! And lastly, who doesn't get thrilled when they hear this song? It makes everyone go b a n a n a s.
We hope this list of songs has helped you narrow down your options. Keep an eye out on our blog for more insight on everything wedding related. Connect with us on Facebook and Instagram to find quick information and insights on our wedding DJ services.